by Taylor, Martha R.; Simon, Eric J.; Dickey, Jean L.; Hogan, Kelly A.; Reece, Jane B. 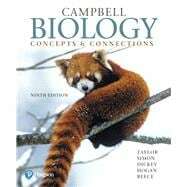 This package includes Mastering Biology . Jean L. Dickey is Professor Emerita of Biological Sciences at Clemson University (Clemson, South Carolina). After receiving her B.S. in biology from Kent State University, she went on to earn a Ph.D. in ecology and evolution from Purdue University. In 1984, Dr. Dickey joined the faculty at Clemson, where she devoted her career to teaching biology to nonscience majors in a variety of courses. In addition to creating content-based instructional materials, she developed many activities to engage lecture and laboratory students in discussion, critical thinking, and writing, and implemented an investigative laboratory curriculum in general biology. Dr. Dickey is author of Laboratory Investigations for Biology, Second Edition, and coauthor of Campbell Essential Biology, Sixth Edition, and Campbell Essential Biology with Physiology, Fifth Edition. Kelly Hogan is a faculty member in the Department of Biology at the University of North Carolina at Chapel Hill, teaching introductory biology and genetics. Dr. Hogan teaches hundreds of students at a time, using active-learning methods that incorporate educational technologies both inside and outside of the classroom. She received her B.S. in biology at the College of New Jersey and her Ph.D. in pathology at the University of North Carolina, Chapel Hill. Her research interests focus on how large classes can be more inclusive through evidence-based teaching methods and technology. As the Director of Instructional Innovation at UNC, she encourages experienced faculty to take advantage of new professional development opportunities and inspires the next generation of innovative faculty. Dr. Hogan is the author of Stem Cells and Cloning, Second Edition, and co-author on Campbell Essential Biology with Physiology, Fifth Edition. Jane B. Reece has worked in biology publishing since 1978, when she joined the editorial staff of Benjamin Cummings. Her education includes an A.B. in biology from Harvard University, an M.S. in microbiology from Rutgers University, and a Ph.D. in bacteriology from the University of California, Berkeley. At UC Berkeley, and later as a postdoctoral fellow in genetics at Stanford University, her research focused on genetic recombination in bacteria. Dr. Reece taught biology at Middlesex County College (New Jersey) and Queensborough Community College (New York). During her 12 years as an editor at Benjamin Cummings, she played a major role in a number of successful textbooks. She is coauthor of Campbell Biology, Eleventh Edition, Campbell Biology in Focus, Second Edition, Campbell Essential Biology, Sixth Edition, and Campbell Essential Biology with Physiology, Fifth Edition.